Notes: Spare MEMS microphone for iRig Acoustic Stage. Works only in association with the iRig Acoustic Stage DSP unit. 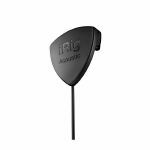 iRig Acoustic Stage uses an ultra-compact MEMS microphone to capture your acoustic's sound from the soundhole. It can be quickly slid into place in the soundhole of the instrument and easily removed with zero modification to the instrument required. This lets you use iRig Acoustic Stage on all of your acoustic steel string guitars, classical nylon strings guitars and even ukuleles or other stringed instruments with a soundhole. 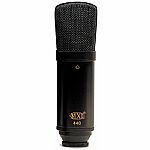 Notes: The MXL 440 is a beautiful studio condenser microphone designed to complement a wide variety of vocal and instrument applications. By combining a FET preamp with an electrically balanced output, the MXL 440 delivers an uncompromised tonal quality perfect for all studio applications. 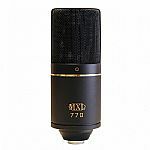 Notes: The MXL 770 continues to amaze recording artists all over the world with its incredible price/performance ratio. Singers, especially rappers, love the 770 for its solid bass, as well as its upfront high-end. The MXL 770 even uses a high quality FET preamp with balanced output for a wide dynamic range. This is a perfect piece for seasoned pros or newbie musicians who want a quality condenser mic that won't break the bank. Notes: The MXL 990 remains one of the industry's most ground-breaking microphones. 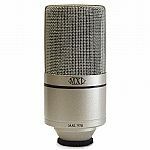 The first high quality condenser microphone to come into reach of working musicians, the MXL 990 has an FET preamp and a large diaphragm for truly professional sound quality in both digital and analog recordings. This revolutionary condenser microphone continues to astound artists with its silky, high end and tight, solid low and midrange reproduction. Notes: The PRM1 Precision Reference Microphone is a special type of microphone that provides an accurate reproduction of a room's sound characteristics for use with audio-analysis tools. It employs a 1/4", pre-polarized electret-condenser capsule with an omnidirectional polar pattern, which allows the microphone to measure reflections, as well as direct signals up to 132 dB SPL. The PRM1 has an all-metal chassis and comes with a clip, foam windscreen, and hard case. What makes the PRM1 different from most mics? Unlike mics you use for recording and live sound, the PRM1 has a narrow dynamic range, since it is intended to receive test frequencies, such as pink noise, at a fixed level. As a result, it is not recommended for recording or performance - but it's the right mic for tuning a sound system to perform accurately in a venue. The PRM1 exhibits linear ("flat") frequency response between 20 Hz and 20 kHz, meaning it captures all frequencies equally within that range. Since it neither boosts nor cuts frequencies, it doesn't colour the sound, making it ideal for measuring what a room or speaker is doing to a sound system's outgoing signal. Designed for use with Smaart and other audio analysis tools. While the PRM1 can be used for a variety of measurement applications, such as MLSSA, Spectrafoo, and TEF, it is especially recommended for use with the Smaart System Check wizards that are integrated into PreSonus UC Surface control software for StudioLive AI and StudioLive RM mixers. With this combination, you can have a complete, powerful, and affordable, audio-analysis and correction system. Notes: Predecessor to the classic SM57 and shipped connected for low-impedance operation, the 545SD features a silent magnetic reed on/off switch with lock-on option. A favourite for instrument pickup and recording, the 545SD can also be used on lecterns in public address systems. Notes: The Shure Beta 52A Kick Drum Mic is a high-output, dynamic microphone with a frequency response tailored specifically for kick drums and other bass instruments. 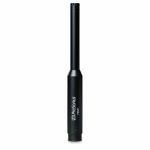 It provides superb attack and punch, and delivers studio-quality sound even at extremely high SPLs. Its modified supercardioid pattern ensures high gain-before-feedback and excellent rejection of unwanted sound. Optimized for low-frequency bass punch and high-power SPL handling, the Beta 52A's supercardioid design provides maximum isolation from other onstage sounds. It is ideal for the professional musician looking to mic up their kick drum, bass amp and acoustic bass. It has the quality and durability to be used on stage and in the studio. The supercardioid pickup pattern limits interference from other on-stage sound sources and reduces feedback. The frequency response is perfectly tailored for bass instruments with a 20Hz to 10 kHz frequency response with a presence boost at 4 kHz to let electric basses and kick drums cut through the mix. Notes: Drum microphone kit includes 4 drum microphones to cover all you need in performance and recording applications. Includes 1 x PGA52 kick drum microphone, 2 x PGA56 drum microphones, 1 x PGA57 instrument microphone, 2 x drum mounts, and 4 x XLR cables. The perfect introduction to Shure engineering excellence, PG ALTA microphones set a new standard in accessible gear, delivering professional-calibre sound while easily withstanding the demands of everyday rehearsal, performance and recording. Notes: Cardioid dynamic kick drum microphone delivering audio clarity in kick drum and low-frequency recording and performance applications. Includes microphone, zipper pouch, XLR cable, and a swivel joint with quick release latch. Notes: The PGA81 is ideal for use in sensitive acoustic instrument performance and recording. Available with and without a cable. Applications: Stereo Recording, Piano/Organ, Acoustic String Instruments, Brass/Woodwinds, Choir, Drums/Percussion. Notes: The PGA98H is optimized for woodwind and brass performance and recording. Available with and without a cable. Wireless version also available. Notes: The PGA98H is a professional quality wind instrument microphone with an updated industrial design that features a black metallic finish and grille offering an unobtrusive visual presence. Legendary Shure quality construction ensures exceptional performance in rigorous environments. Notes: The SM137 is a versatile, flat-response cardioid condenser probe microphone. The SM137 can be used with the Acoustic Bass Acoustic Guitar Cymbals Guitar Amp Orchestra/Strings Percussion Piano/Organ Stage Overhead Studio Ensemble Studio Instrument Woodwinds. Notes: The legendary Shure SM57 is exceptional for musical instrument pickup and vocals. With its bright, clean sound and contoured frequency response, the SM57 is ideal for live sound reinforcement and recording. Outstanding performance, reliability, and application diversity make this workhorse the choice of performers, producers, and sound engineers worldwide. Notes: The SM94 is a unidirectional electret condenser microphone tailored to the instrument miking needs of professional musicians and sound engineers in both live performance and sound recording. Its smooth, flat frequency response is free of either a presence peak or a low-frequency rolloff, making it a perfect choice for all types of musical instruments. The SM94 is equally at home in sound reinforcement systems or in sound studios and motion picture/TV scoring stages. It is ideally suited for most instruments including harmonica, cymbals, brass and saxophone, as well as guitar amps. When used with the optional wind-screen, the SM94 can be used by vocalists and speech-makers who desire a wide, flat response with minimum coloration. Notes: TM-DRUMS is a set of four microphones tailored for getting a good drum sound with ease using a Tascam multi-track recorder or audio interface with DAW software. Especially designed for beginners who cannot afford separate mics for each and every part of the drum kit, this mic set meets the minimum requirements for multi-microphone recordings and can even be handled by people who are not yet so familiar with creating a good sounding mix with many sources. The TM-50DB's frequency response delivers a thick bass thump with the right amount of punch, while the TM-50DS enhances the special character of the snare drum with attack and clarity. The TM-50C microphone can be used as an overhead microphone to capture the sound of your hi-hat and cymbals. As a condenser microphone, it handles high sound pressure levels and captures a wide frequency range. Since there are two of these in the set, you can also use that pair to easily create a stereo recording of the entire drum kit, supported by the two mics for kick and snare drum. Creating a great-sounding drum sound is not hard to accomplish. With two overhead microphones and separate mics for the kick drum and snare drum, you'll get a wide stereo image with clear highs. Start with the overheads and try out different positions until you find that toms, cymbals and hi-hat build a balanced base sound. Then, add a thick kick drum and a well-defined snare drum to that base sound with their separate mics. If a clear hi-hat is important to your music, you can emphasize it by placing one of the TM-50C over the hi-hat and use the second TM-50C as overhead on the other end of your drum kit. By going this way, you will have more influence on the basic instruments: kick, snare, and hi-hat. You will certainly find a good position for the overhead mic where it can capture the rest of your kit. This approach does not deliver a stereo image like with two overheads but it still gives you some amount of width when panning the hi-hat to one side and the overhead to the other side. Tascam TM-80 Once you created your basic drum sound and you're familiar with multi-microphone recording, it is easy to add more mics. Is your drum kit located in a room with a nice ambient sound? Why not add that room ambience to make your sound more natural?